It is the time of year when we’re busy with our holiday traditions and can easily forget the needs of our pets. In our distraction, we might forget just how many dangers are present to pets during the holidays. Included in this article are a few things to watch out for during Christmas and New Year’s to keep it a safe and happy season. Holiday visitors can leave prescription and over-the-counter medications in areas that accessible to your pets. Remind them to keep their medications locked away, because they may be toxic to pets. Also remind them not to feed your pet human food under the table. Turkey skin, gravy, scraps and the fixings that go along with this meal can cause severe stomach and intestinal upset in animals. It can even lead to pancreatitis, a very painful condition that might require hospitalization. Make sure your pet cannot get at the garbage or any utensils that have remnants of these foods on utensils or in the garbage. Dogs will eat almost anything, including bread dough before it has been baked. This dough can cause severe distention of the stomach as it expands, compromising the cardiovascular system and leading to collapse. The yeast in the dough can also ferment, leading to ethanol toxicity. Keep all Christmas candies away, especially anything that contains chocolate or xylitol, which is found in sugarless gum, mints and baking mixes. Diabetics might eat food with xylitol in place of sugar. Candy wrappers can be irritating to the intestines and cause vomiting or, more seriously, an impaction of excrement. The string used to tie the turkey is flavorful to cats and dogs—cats may think that it’s a particularly tempting toy—and is readily ingestible. The string can cause a severe problem with the intestines, possibly leading to a rupture and emergency surgery. 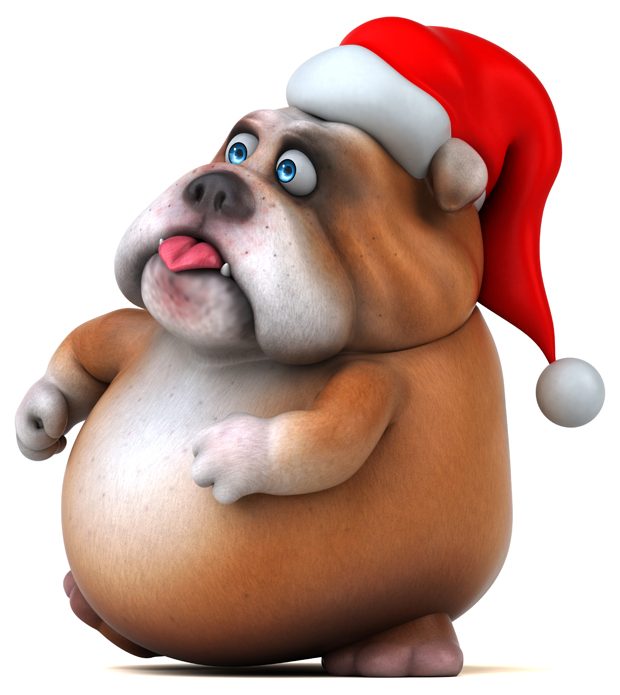 And don’t forget to keep your dog or cat away from any turkey bones that can splinter or get stuck in the intestines. Many dog bones present this danger. Seasonal decorations, gift wraps and ornamental lighting can be bitten into or swallowed. Broken ornaments can cut paws. Tinsel is especially problematic because it’s irresistible to many cats. It has sharp edges and can easily cut through the intestines, leading to severe disease and emergency surgery to save your pet’s life. Artificial and natural Christmas trees can contain preservatives, pesticides, toxins and oils to keep them fresh and prevent fires. The water used to keep a real tree fresh can contain these toxins, so keep it covered. Needles from trees can be ingested, inhaled, or penetrated into body parts, causing serious harm. Many holiday plants, both leaves and berries, can be toxic, so keep your pet away from all of them to be safe. This is especially true for holly, mistletoe and possibly poinsettias. Any part of a lily plant is toxic to cats. The water at the base of these plants contains these toxins, so keep it covered. Biting into the extra electrical cords used to light Christmas decorations can cause a severe lung reaction, leading to fluid buildup and death. Keep these cords covered, particularly if you have rabbits hopping around the house. Batteries for toys can be easily bitten into or swallowed. This can cause an obstruction or severe toxicity. Let’s not forget the ubiquitous fruitcake that nobody except for the dog and the odd cat seems to eat. Since fruitcake contains candied fruits, spices, and sometimes alcohol and nuts, your pet can become ill.
And of course, the alcohol that flows so freely into the cups of holiday cheer is also toxic. But even with a list this long, there’s an even longer list of happy and pleasurable things. Long Beach Animal Hospital wishes them for you and your pet!